We'll be straight to the point and give you some nice and easy Madden 18 Coins Farming tips. Firstly, you need some coins to make more coins. Getting a base of coins in Auction House , then play the Longshot mode to unlock Longshot challenges. It can make you earn more coins fast. Of course, daily solo challenges will bring some Madden 18 coins to you. Trading player packs is also a fast way for you. Buy a silver or better player in store then resell it in Auction House. You may get 300 to 500 coins with this method as the price of player pack is always changed. Farming coins with Silver Team Tokens can double your coins in a short time. Turn these tokens into playbooks and stadiums. Sniping Auction House is also a good way. Invest in the cheap players you found in Auction House Filter and check prices on MUThead and then sell them quickly to get more Madden 18 coins. Pay attentiion to the best time to buy and the best time to sell. 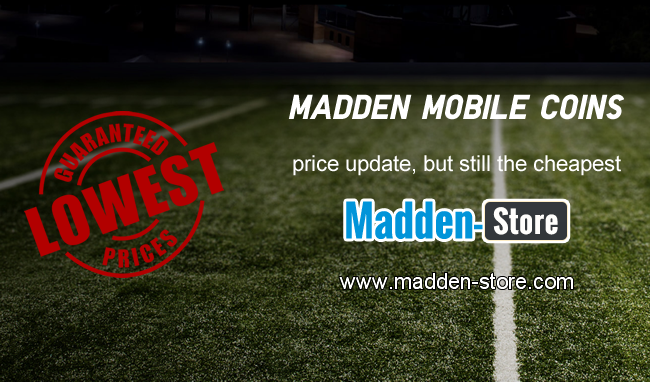 Madden-Store.com as one of the most professional online store which glad to share more Madden 18 news and cheap Madden 18 coins with instant delivery.